Soprano Amanda Opuszynski has spent the past two weeks on tour with the Young Artists Program as they made their way around the state performing Donizetti's Viva la Mamma! Opuszynski, pictured right with fellow YAPs David Krohn and Erik Anstine (Bill Mohn, photo) plays the role of the entitled and demanding Prima Donna. Today we talk to her about the tour, her character, and her own development as a singer. You can catch the final performance of the YAP's production of Viva la Mamma! tomorrow night at Benaroya Hall. When and how did you get involved with opera? I started taking voice lessons when I was 11, but I had absolutely no exposure to opera until I was about 16. Until then, I was obsessed with musical theater and wanted to be on Broadway! My voice teacher suggested that I take a break from belting to learn the Habanera from Carmen for an upcoming studio recital. I got a lot of positive feedback, so I entered a couple local and national classical voice competitions and won! Encouraged by my teacher, I went on to study classical voice in college, and I never really looked back. As it turned out, opera was perfect for my skill set and my personality. I love that there is longevity in this career, and that it requires a willingness to continually study and learn. And, of course, the music is gorgeous. What has your performance and education background been so far? I did my undergraduate work at University of Michigan, where I actually trained as a mezzo-soprano. Then in the fall of my senior year, I was cast as Musetta in La bohème. My voice began to grow and change until my teacher and I realized that I should make the switch to soprano. Rather than take time off to make the transition, I went straight to graduate school at the University of Maryland Opera Studio as a soprano. At Maryland, I performed the role of Adina in L'elisir d'amore. In addition to formal education, I spent the summers of 2007 and 2008 singing with the Ohio Light Opera, where I learned a lot about stamina and versatility. 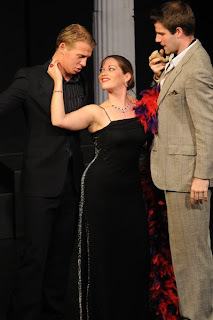 In 2009, I was a Studio Artist at Wolf Trap Opera, and in May, I went back to sing in a workshop of their newly commissioned opera, The Inspector, by John Musto and Mark Campbell. Is there a dream role you hope to one day perform? I am dying to sing Mimi in La bohème, but I think that one is still a few years away! The music is so incredibly gorgeous, and Mimi has such a touching story to tell. I also harbor secret dreams of Violetta, Tosca, and Desdemona, but all of those roles are eons away right now. 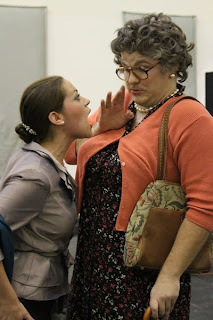 Have you had the opportunity to perform comic roles, like Viva la Mamma!, in the past? Do you find comedy to be easier or harder than drama? Adina and Musetta definitely have moments of comedy, and I have done several comic sidekick roles in various operettas and musicals. I think that comedy can be very tricky because it has to be played with relative realism to be funny. It can be tempting to play generalities and stereotypes, but that isn't what makes the audience laugh! They want to see real people in real situations that become absurd. On the other hand, I feel like there is less vulnerability in comedy than in drama. In drama, people want to see your soul. What’s it like playing shows all over the state? The travel is spaced out over a couple weeks, but when you perform two shows in a weekend, does the travel between venues take a toll on your voice/energy? This is my first time doing a tour like this, and I've certainly learned a lot about what I need to perform well. It's surprisingly exhausting to sit in a van for hours on end! Water and sleep are essential, but not always easy to come by in hotels. The hardest part for me has been maintaining some semblance of healthy eating and exercise with such a crazy schedule. Luckily, my voice has been holding up pretty well, and I haven't gotten sick yet. Many of the characters in Viva la Mamma! are stereotypes of people in opera and theater – especially your character, which is a total diva. Where did you find inspiration for this role? I have had the pleasure of working with very professional, kind colleagues, so I can't honestly say that any of my peers have inspired my character. My inspiration has come more from divas outside the world of opera. I think we have all encountered people who feel entitled to better treatment, who think the world of themselves, who relish every opportunity to step into the spotlight. You don't have to be an opera singer to be a real life Prima Donna! Do you have any plans lined up for after you finish the YAP in the spring? What are your goals for the next couple years of your career? I'm currently in the middle of auditioning for summer 2011 positions, so you'll have to check back with me after the holidays to see where I end up! I am hoping to sing somewhere this summer and come back to Seattle for a second season, but that isn't up to me. I'm pretty young in this business, so I think I could benefit from a few more years of YAP training, here or elsewhere, as my voice continues to develop and mature. What would you say is the biggest challenge for young artists beginning their careers today? You need an incredible amount of stamina and drive to survive in this business. You have to accept that you will have to do several auditions and maybe get one job out of it, and that that job will only last for a finite amount of time. We are constantly putting ourselves out there, trying to figure out the next step, and it's nearly impossible to plan more than a few months of your life in advance. You need to have a deep-rooted belief in yourself and your talent to withstand all of this uncertainty, and to know without a doubt that this is the only career for you.